Except as expressly provided in the regulations, it is unlawful to hunt, capture, kill, take, possess, transport, buy or sell any migratory game bird or part thereof. Aids and Equipment: It is lawful to hunt migratory game birds with dogs, artificial decoys, manually or mouth-operated bird calls, hand-held bow and arrow, crossbow, the practice of falconry, or with a shotgun not larger than No.10 gauge and incapable of holding more than three shells, fired from the shoulder. Every other method is unlawful. the progress or motion of the craft in the water has ceased and the craft is drifting, beached, moored, resting at anchor, or is being propelled solely by paddle, oars, or pole. It is lawful to use a motor or sail on a craft as a means of retrieving or picking up dead or injured birds. Identifiable condition: If such birds are dressed, one fully-feathered wing must remain attached to each bird so as to permit species identification while being transported between the place where taken and the personal abode of the possessor or a commercial preservation facility. Properly marked package: The package or container in which such birds are transported shall have the name and address of both the shipper and the consignee and an accurate statement of the numbers and kinds of birds contained therein clearly and conspicuously marked on the outside thereof. Tagging Requirement: A hunter who legally takes and possesses migratory game birds and wishes to place or leave any such birds in the custody of any other person for picking, cleaning, processing, shipping, transportation, or storage (including temporary storage) must sign and attach a tag to the birds stating the hunter's address, the total number and kinds of birds, and the date such birds were killed. No person may receive or have in custody any migratory game birds belonging to another person unless such birds are tagged as provided above. Untagged Birds: If birds are not tagged as provided above, the only legal place of storage is the personal abode of the hunter who legally took and possesses the birds. Vehicles: Legally possessed migratory game birds being transported in any vehicle as the personal baggage of the possessor are not deemed to be in storage or temporary storage. Record Keeping: Any commercial picking establishment or cold-storage or locker plant receiving, possessing, or having in custody any migratory game birds must maintain accurate records showing the numbers and kinds of such birds, the dates received and disposed of, and the names and addresses of the persons from whom such birds were received and to whom they were delivered. These records shall be retained for a period of 1 year from the close of the open season on migratory game birds in the state where the picking establishment or cold-storage or locker plant is located. Every migratory game bird wounded by hunting and reduced to possession by the hunter shall be immediately killed and become a part of the daily bag limit. Any person, without a permit, may possess and transport for his own use the plumage and skins of lawfully taken migratory game birds. No person shall kill or cripple any migratory game bird pursuant to this regulation without any visible means to retrieve and without making a reasonable effort to retrieve the bird and include it in his daily bag limit. The shooting of crippled waterfowl from a motorboat under power is permitted on those coastal waters and all waters of rivers and streams lying seaward from the first upstream bridge. 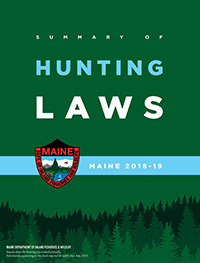 Additionally, Maine state law states that a person may not waste a wild bird that has been wounded or killed by that person while hunting, or intentionally leave any wounded or killed animal in the field or forest without making a reasonable effort to retrieve and render it for consumption or use. Migratory game birds may be taken only in accordance with open seasons, legal shooting hours, and daily bag and possession limits. Bag Limit: No person may take in any one day more than the daily bag limit or aggregate daily bag limit, whichever applies. Possession Limit: No person may possess more birds lawfully taken than the possession limit or the aggregate possession limit, whichever applies. Opening Day: On the opening day of the season, no person shall possess any freshly killed migratory game birds in excess of the daily bag limit, or aggregate daily bag limit, whichever applies. Closed Season: No person may possess any freshly killed migratory game birds during the closed season. Notice: The material below is only a summary of Federal rules. Each hunter should also consult the actual Federal regulations, which may be found in Title 50, code of Federal Regulations, Part 20. A. While possessing shot (either in shot shells or as loose shot for muzzleloading) other than steel shot or such shot approved as nontoxic while taking Anatidae (ducks, geese, and brant), coots and any species that make up aggregate bag limits during concurrent seasons. B. With a trap, snare, net, rifle, pistol, swivel gun, shotgun larger than 10-guage, punt gun, battery gun, machine gun, fishhook, poison, drug, explosive, or stupefying substance. C. With a shotgun capable of holding more than three shells, unless it is plugged with a one-piece filler that cannot be removed without disassembling the gun. D. From a sink box (a low floating device, having a depression affording the hunter a means of concealment beneath the surface of the water). E. From or with the aid or use of a car or other motor-driven land conveyance, or any aircraft, except that paraplegics and single or double amputees of the legs may take from any stationary motor vehicle or stationary motor-driven land conveyance. "Paraplegic" means an individual afflicted with paralysis of the lower half of the body with involvement of both legs, usually due to disease of or injury to the spinal cord. F. By the use or aid of live decoys. All live, tame or captive ducks and geese shall be removed for a period of 10 consecutive days prior to hunting, and confined within an enclosure which substantially reduces the audibility of their calls and totally conceals such tame birds from the sight of migratory waterfowl. G. Using records or tapes of migratory bird calls or sounds, or electrically amplified imitations of bird calls. H. By means or aid of any motor driven land, water, or air conveyance, or any sailboat used for the purpose of or resulting in the concentrating, driving, rallying, or stirring up of any migratory bird. I. By the aid of baiting or on or over any baited area, where a person knows or reasonably should know that the area is or has been baited. However, nothing in this paragraph prohibits the taking of migratory game birds on or over the following lands or areas that are not otherwise baited areas: a) standing crops or flooded standing crops; standing, flooded, or manipulated natural vegetation; flooded harvested croplands; or lands or areas where seeds or grains have been scattered safely as a result of a normal agricultural planting, harvesting, post-harvest manipulation or normal soil stabilization practice; b) from a blind or other place of concealment camouflaged with natural vegetation; c) from a blind or other place of concealment camouflaged with vegetation from agricultural crops, as long as such camouflaging does not result in the exposing, depositing, distributing or scattering of grain or other feed. J. A person must also retain the bird in his actual custody, at the place where taken or between that place and either (a) his automobile or principle means of land transportation; or (b) his personal abode or temporary or transient place of lodging. Maine-New Brunswick border in Baileyville, Maine west along Stony Brook to Route 9 in Baileyville. West along Route 9 to Route 15 in Bangor. West along Route 15 to I-95 in Bangor. Southwest along I-95 to Route 202 (Exit 109A) in Augusta. Southwest along Route 202 to Route 11 in Auburn. Southwest along Route 11 to Route 110 in Newfield. West along Route 110 to Maine-New Hampshire border. Maine-New Brunswick border in Calais at the Route 1 bridge. South along Route 1 to the Maine-New Hampshire border in Kittery. All dates are inclusive except that hunting is prohibited on Sunday. Crows are neither migratory waterfowl or migratory game birds. The use of lead shot and the use of a shotgun capable of holding more than three shells is permitted. A migratory waterfowl stamp is not required. Note: Crows are neither migratory waterfowl or migratory game birds. The use of lead shot and the use of a shotgun capable of holding more than three shells is permitted. A migratory waterfowl stamp is not required. Note: Snipe are considered migratory game birds, not migratory waterfowl. The use of lead shot is permitted. The use of a shotgun capable of holding more than three shells is prohibited. A migratory waterfowl stamp is not required. Note: Woodcock are considered migratory game birds, not migratory waterfowl. The use of lead shot is permitted. The use of a shotgun capable of holding more than three shells is prohibited. A migratory waterfowl stamp is not required. Note: Rails are considered migratory game birds not migratory waterfowl. The use of lead shot and a shotgun capable of holding more than three shells is prohibited. A migratory waterfowl stamp is not required. Sea Duck Hunting Area: All coastal waters and all waters of rivers and streams seaward from the first upstream bridge. Coastal Zone: Includes areas south of a line beginning at the Maine-New Brunswick border in Calais at the Route 1 bridge, south along Route 1 to the Maine-New Hampshire border in Kittery. Harlequin Ducks, Barrow's Goldeneye, Moorhens and Gallinules. Closed Season. American Coots: It is unlawful to take more than 5 American coots in any one day or possess more than 15 American coots at any time. Mottled Ducks, and Fulvous Whistling Ducks: The daily limit on these species shall not include more than 1 bird; possession limit shall not include more than 3 of these species. Black Ducks, Hen Mallards, Scaup, Redheads, Canvasbacks and Northern Pintails: The daily limit on these species shall not include more than 2 birds; possession limit shall not include more than 6 of these species. Mergansers: Hunters may take 5 mergansers in the addition to the limits on other regular ducks, however only 2 may be a hooded merganser. It is unlawful to possess more than 15 mergansers at any time (only 6 of which may be hooded mergansers). Sea Ducks: Within the Sea Duck Area defined above, hunters may take 5 sea ducks in addition to the limits on regular ducks (but not more than 4 scoters or 4 eiders or 4 long-tailed ducks). Wood Ducks: It is unlawful to take more than 3 wood ducks in any one day or to possess more than 9 wood ducks at any time. Falconry season daily bag and possession limits for all permitted migratory game birds shall not exceed 3* and 9* birds, respectively, singly or in aggregate. * All species restrictions apply. Special Youth Waterfowl Hunts: All duck species except Harlequins, Barrow's Goldeneye, and Moorhens and Gallinules – may be hunted on these days, including geese. For the October 20, November 3, December 8 youth days, the goose limit is under the Regular Season limit. On September 15, September 22, October 20, November 3, December 8, scoters, eiders, and long-tailed ducks may be taken as part of the 6 bird daily limit on regular ducks. Also on these dates, 1 Black Duck may be taken. Special regulations apply to youth and accompanying adult. Please see Junior Hunters. All coastal waters and all waters of rivers and streams seaward from the first upstream bridge. In all other areas, sea ducks may be taken only during the regular duck season dates and are part of the regular duck bag limits. Hunting hours on migratory game birds are from 1/2 hour before sunrise to sunset daily. The use or possession of ammunition loaded with other than nontoxic shot while hunting wild ducks, geese, brant, rails, or coots is prohibited. Nontoxic shot means any shot type that does not cause sickness and death when ingested by these birds and is approved for use by the Director, U.S. Fish and Wildlife Service. Steel, bismuth-tin, tungsten-iron (2 types), tungsten-matrix, tungsten-bronze (2 types), tungsten-polymer, tungsten-tin-bismuth, tungstentin- iron-nickel, and tungsten nickel-iron (HEVI) shot have been approved nontoxic by the U.S. Fish and Wildlife Service. On National Wildlife Refuges that permit hunting of upland game, persons hunting upland species other than deer and turkey with a shotgun shall possess and use only nontoxic shot while in the field. The State Migratory Waterfowl Permit is required of anyone 16 years of age or older if they are hunting on an adult license, but is not required if continuing to hunt on a junior license for the remainder of the calender year. Anyone who turns 16, whether hunting on an adult license or a junior license, must purchase a Federal Stamp The Federal Stamp must be validated by the holders signature written across the face of the stamp in ink. The state permit may be purchased for $7.50 from local license agents or from the Department of Inland Fisheries and Wildlife, 284 State St., SHS #41, Augusta, ME 04333. The Federal stamp can be purchased by visiting your local Post Office or USPS.com. The Migratory Waterfowl Stamp is not required to hunt woodcock, snipe, rails or crows. For more details, contact the Department of Inland Fisheries and Wildlife at 287-8000. Note: All revenue from the sale of state waterfowl permits must be used exclusively for acquisition of waterfowl habitat and waterfowl management activities. The provisions of the following apply to the waters of the Kennebec River, known as Merrymeeting Bay, bounded as follows: From the high tension wires at Chop’s Point to the first dam on the Androscoggin River, to the first road bridge on the Muddy, Cathance, Abbagadassett, and Eastern rivers and the Richmond-Dresden bridge on the Kennebec River, being in the counties of Cumberland, Sagadahoc, and Lincoln. No artificial cover which is termed stationary blind, or parts thereof, used for hunting purposes shall be left or allowed to remain in the waters of Merrymeeting Bay between one hour after legal shooting time and one hour before legal shooting time. No duck decoys shall be allowed to remain in the waters of Merrymeeting Bay at any time during the period from one hour after legal shooting time until one hour before legal shooting time. No power boat may be operated in Merrymeeting Bay at a speed in excess of 10 miles per hour except within the confines of the buoyed channels. No power boat may be operated within Merrymeeting Bay Game Sanctuary, except between the Woolwich shore on the east and a line on the west designated by a series of orange buoys adjacent to the edge of the grassy marsh area from Kelly's Point to the southern boundary of the Merrymeeting Bay Game Sanctuary. Hunting is not allowed within the Merrymeeting Bay Game Sanctuary. View map of Merrymeeting Bay Game Sanctuary. Closed to Hunting: It is unlawful to hunt waterfowl on Haley Pond in the Town of Rangeley and Dallas Plt. in Franklin County. It is unlawful to shoot, or shoot at, or near, any wildfowl decoy of another person, with a rifle, pistol, or shotgun with a ball, slug, or buckshot. “Near” means the area encompassed by the set of decoys and including the area 50 yards away from the outer perimeter of the set of decoys. Your 2017 Maine duck stamp, featuring a Common Eider, was designed by Rebekah Lowell of Biddeford, Maine. It was selected by a panel of judges from among 13 paintings by Maine resident artists in the 2017 duck stamp art contest conducted by the Maine Department of Inland Fisheries and Wildlife. Proceeds from the sale of the annual duck stamps and permits are used to help finance waterfowl management programs or to acquire waterfowl habitat. If you plan to hunt woodcock, ducks, geese, snipe, rails, or coots, you are required to indicate on your license your intention of doing so at the time you purchase your license. (Complimentary and lifetime license holders are exempt from this requirement). The information will be used by the U.S. Fish & Wildlife Service in the Migratory Bird Harvest Information Program (H.I.P). For more information, see Maine's Migratory Bird Harvest Information Program. Help Stop the Spread of Invasive Plants! Please clean boat trailer and gear of all plants and plant fragments. No person shall possess more than one daily bag limit while in the field or while returning from the field to one’s car, hunting camp, home, etc. For information regarding the importation of migratory birds killed in another country, hunters should consult 50 CFR 20.61 through 20.66. One fully-feathered wing must remain attached to all migratory game birds being transported between the port of entry and one's home or to a migratory bird preservation facility. No person shall import migratory game birds killed in any foreign country, except Canada, unless such birds are dressed (except as required in 20.63), drawn, and the head and feet are removed. No person shall import migratory game birds belonging to another person. Violation of State migratory bird regulations is also a violation of Federal regulations. More restrictive regulations may apply to National Wildlife Refuges open to public hunting. For additional information on Federal refuge regulations, see National Wildlife Refuges. Can you tell the difference between a Common and a Barrow's Goldeneye? The Maine Department of Inland Fisheries and Wildlife wishes to continue the lawful hunting of Common Goldeneyes while ensuring adequate protection of the Barrow's Goldeneye, a Threatened Species under the Maine Endangered Species Act. Barrow's and Common Goldeneyes look very similar. Our goal is to reduce the unintentional take of Barrow's in Maine by improving duck hunters' abilities to distinguish them from Common Goldeneyes. Barrow's are known to congregate in certain areas. Despite our efforts, we suspect that a few Barrow's Goldeneyes may be unintentionally shot. In these cases, hunters are required to report to your local game warden, and surrender to MDIFW, any that are taken during legal waterfowl hunting activities. There is no penalty for reporting this. Results will provide better estimates of survival and harvest rates and will reduce high costs associated with banding studies. If you are unable to locate a warden at one of the above headquarters, contact either the Fisheries and Wildlife Department headquarters in Augusta (287-2766) or the nearest State Police Barracks.